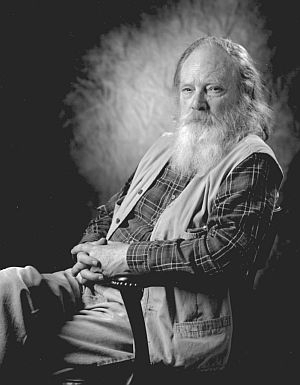 (HOST) Poet Hayden Carruth died this week at the age of 87. For twenty-five years, the Northeast Kingdom was his chosen home, and for many years it was the home of his poetic imagination. VPR’s Betty Smith has this remembrance. (Smith) Carruth’s work was filled with the images and vernacular of the region. Poet Galway Kinnell spoke at a Vermont tribute to Carruth in 2002. He said that when Carruth moved to Vermont in the late 60’s he discovered a mostly unsung world of rural, northern farmers. (Kinnell) Hayden’s poems sing of that world and of the old timers who inhabited and inhabit it, their values, their sense of humor, their knack for storytelling, their language and their love of language. And these poems to me form the core of the amazingly various poems of Hayden’s Vermont years. (Smith) Carruth’s work inevitably led to comparisons with Robert Frost – a comparison that Carruth himself resisted. At the Vermont tribute, Ellen McCullough Lovell, now president of Marlboro College, read an excerpt from one of Carruth’s poems that spoke of the Frost comparisons. (Smith) Carruth’s poetry also reflects a contemporary taste for jazz, an appreciation he shared with poet, playwright and "Judevine" author David Budbill. (BUDBILL) Hayden and I spent most of our time together talking about and listening to music because were both great fans of jazz. Hayden… has written many, many essays about jazz and he’s written many, many poems about jazz and about music and about jazz musicians so it’s all over his work. (Smith) VPR’s George Thomas once interviewed Carruth. In this exchange, Carruth explains how he came to write his book on jazz called "Sitting In". (Carruth) One of the things I had to learn with some difficulty was that I don’t know music theory at all to speak of and I know something about the technique of playing a reed instrument ’cause I used to play the clarinet but that doesn’t go very far really. So you have to just say what you feel, what your subjective reaction to the music is and if you do it intelligently and with good observation then people will respond to it. (Smith) Carruth had a long and distinguished career. He wrote more than 30 books, including poetry, anthologies and a novel. He had been the poetry editor of Harper’s, and he also taught at Syracuse University. He won many awards, including the National Book Award for poetry for "Scrambled Eggs and Whiskey" in 1996. He was awarded the Vermont Governor’s Medal. And he was a finalist for the Pulitzer Prize in 1987 for "The Selected Poetry of Hayden Carruth." At the Statehouse tribute in 2002, the House chamber was packed, including the gallery. Nine speakers, notables themselves, took the podium to honor Carruth and read his work. Then Carruth got up to read "The Cows at Night." He told the audience this was as good a poem as he had ever written when he was in what he called "his bucolic mood." (Smith) Hayden Carruth, reading "The Cows at Night" in 2002. He is survived by his wife, Joe-Anne McLaughlin Carruth of Munnsville, New York; a son, David, and three grandchildren. For VPR News, I’m Betty Smith. Note: "The Cows at Night" is from "Collected Shorter Poems" by permission of Copper Canyon Press. VPR’s Mitch Wertlieb talks with Scott Wheeler, Danny Gore and Robert Jenks about life in the Northeast Kingdom. Carruth published more than 30 books and was known for his poems about the people and places in northern Vermont.